Hillary Clinton's campaign chairman met and corresponded on multiple occasions in his capacity as a top White House adviser with a previous employer seeking energy policies that it described as a potential "gold rush," hacked emails and public records show. John Podesta was a top White House energy policy official before joining the Clinton campaign last year. He previously served on the board of renewable energy investment firm Equilibrium Capital. He owned stock in the firm and drew $4,000 in annual "board fees." White House ethics rules bar employees from working on issues affecting former clients or employers for two years after taking their jobs. However, internal emails show that Podesta was in contact with Equilibrium within months of joining the White House as the company pursued a new energy efficiency financing model that would steer it significant revenue. 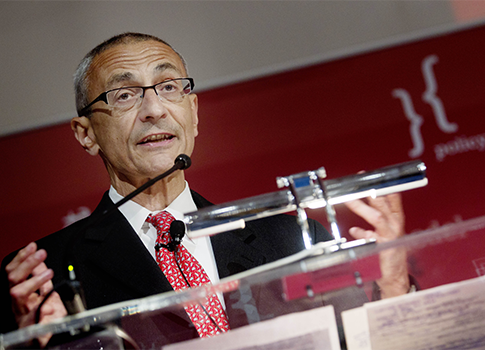 Podesta was on Equilibrium’s board from 2010 until he joined the White House in January 2014. Documents emailed to him later that year show that he owned just under $170,000 in Equilibrium stock at the end of 2013. Podesta sold the stock upon taking his White House post, according to his public financial disclosure statement. Under ethics rules governing the "revolving door" between government and the private sector, Podesta was barred from "participat[ing] in any particular matter involving specific parties that is directly and substantially related to [a] former employer or former clients" within two years of joining the administration. Bill Campbell, an Equilibrium principal and the company’s general counsel, emailed Podesta at his official White House address in July 2015, about seven months after he took the job. Campbell wanted help in recruiting executives at major utilities who would back a proposed California energy efficiency financing scheme called a metered energy efficiency transaction structure (MEETS). MEETS allows investors to finance energy efficiency projects on private land, pay its owners monthly premiums, and sell the saved energy back to the electric utility. The arrangement was pioneered by a Seattle company called Energy Resource Management (ERM), which also manufactures the metering devices used to gauge how much energy is being saved. Equilibrium is an ERM investor, and Campbell is the company’s executive chairman. "We think [MEETS] can unleash an EE [energy efficiency] gold rush," Campbell told Podesta. "But till we show it, the problem is ‘proving there's gold at Sutter's Mill.’"
Campbell said that California regulators were "intrigued," and that state public utilities commissioner Mike Florio was fully on board. But he was worried that utilities would not adopt MEETS until it was adequately scaled and demonstrated, which would require a senior utility executive to take the lead and publicly back the model. "If our approach seems strategic from a US policy perspective, then it is important that the approach hits this ‘at scale’ milestone," Campbell told Podesta. "For this purpose I'd like to brainstorm with you this process of ‘internal champions.'" The email was one of thousands released by the group Wikileaks after hackers believed to be acting at the direction of the Russian government breached Podesta’s email account. Podesta had already spoken with another Equilibrium executive about its efforts, Campbell’s email revealed. "Dave tells me you two talked today about our progress towards MEETS in California," he wrote. 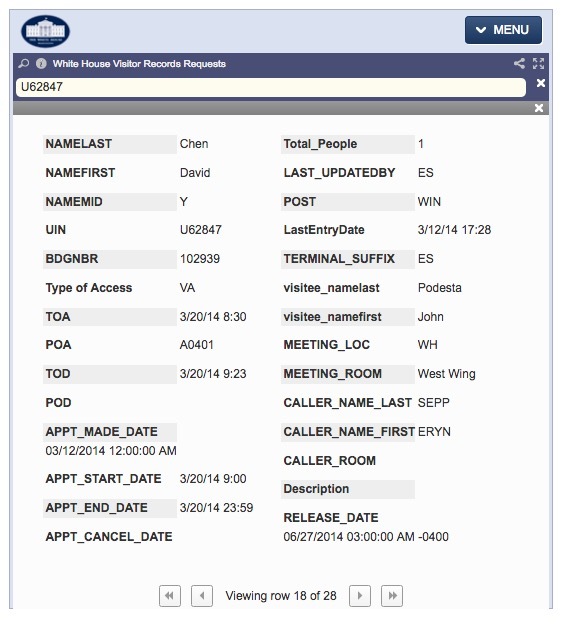 Dave appears to be Equilibrium chairman Dave Chen, who met with Podesta in the West Wing in March 2014, according to White House visitor logs. Chen says he never requested Podesta's assistance with issues affecting Equilibrium's business. "I made no asks of him, and as far as I know, he took no action on our behalf," he said in an email. Campbell did not respond to questions about his correspondence with Podesta. The Clinton campaign denied that Podesta took any action to benefit Equilibrium while at the White House. "You can try to distort White House logs however you want, but John Podesta did not take any official action related to the company at this time or any other time while serving at the White House and was never asked to do so," wrote spokesman Josh Schwerin in an email. "Podesta was in full compliance with all government ethics rules." Schwerin would only address Chen's White House visit, declining to confirm the authenticity of or comment on Campbell's email, the release of which he attributed to a "pawn of the Russian government." However, former U.S. Attorney Matthew Whitaker said that email contained the more troubling revelations. If Podesta had acted on Campbell's request, it would have constituted a "blatant violation" of White House ethics rules' two-year "cooling off" period for work on behalf of former clients and employers. "This is very disappointing but we have come to expect these behaviors out of what was supposed to be the most transparent administration in our nation's history," Whitaker, who leads the Foundation for Accountability and Civic Trust, an ethics watchdog group, said in an email. "The Obama administration has dramatically missed this mark." Podesta's relationship with Equilibrium has occasionally put him in a politically difficult position. When he defended Clinton's record on financial regulation at a campaign event last year, Yahoo News noted that he was wearing a fleece jacket emblazoned with the investment firm's logo. Chen previously served as an advisory board member of a group called the Clean Economy Development Center, according to an archived version of that group's website. The CEDC was at the center of a 2015 scandal that forced former Oregon Gov. John Kitzhaber to resign. One of Kitzhaber's top aides, Dan Carol, was found to have arranged a fellowship at the CEDC for Kitzhaber's fiancée, who advised state government on climate policy while drawing a paycheck from the nonprofit group. Carol subsequently became the highest paid member of the governor's administration. Carol, who worked in Oregon to implement environmental policy at the state level, has kept in touch with Podesta, according to hacked emails. He is now an adviser at a Georgetown University initiative that pursues "social impact" policies. "I would love to touch base to build maximum alignment around both 2016 and 2020/longer-term outcomes," he told Podesta in late 2015. About two weeks before Podesta joined the White House, he got an email from Bracken Hendricks, a climate policy expert at the Podesta-founded Center for American Progress. It laid out five climate policies that the Obama White House could pursue through executive actions. Like Chen, Hendricks had also advised the CEDC. This entry was posted in Politics and tagged John Podesta. Bookmark the permalink.